Recognizes 6-22 point font size text (bold, italic, underlined, inverted). Alternative input tools are included for entering words that you can`t scan (e.g., street signs). 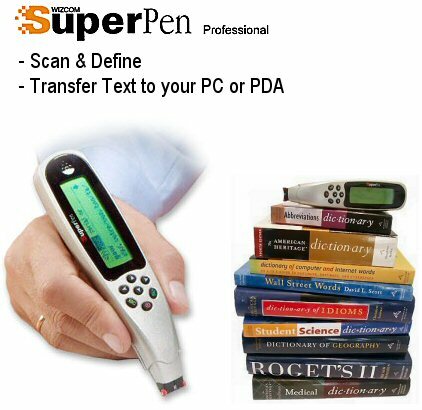 SuperPen Professional can also scan, store and transferprinted data to a PDA, PC or any Windows application making it the perfect tool for the busy executive and college student alike. Scan and Define: SuperPen Professional enables users to scan professional terms and receive instantaneous definitions from one or a number of the on-board professional dictionaries. Integrated Text-to-Speech technology enables users to pronounce new words with confidence. Scan, Store and Transfer: This function enables users, on the go, to capture essential printed data (text and small images) anytime, anywhere. The product can store over 1,000 pages of printed text, to be transferred to PC or PDA via a USB connection at leisure. Users working with their computer can scan printed text directly to the active cursor point. Collected data can be transferred to any Windows based application seamlessly.